Students will learn how to organize and prepare a speech. Students will learn techniques for presenting information to an audience. Students will present information to an audience in an organized, professional manner. Students will use body language and verbal skills to effectively communicate information to an audience. Students will read a book from a time period in U.S. History and communicate the main ideas of that book to an audience. Students will read a book on a topic from United States History. As they read, they should fully complete the Reader's Notes worksheet to compile information to present to the audience when they give their speech. While taking notes, students should think about how they want to organize the information they collect. Since an audience will hear a lot of information, it helps to organize a speech into a pattern. There are three main patterns: chronological, topical, and cause and effect. Chronological means that events are presented in the order in which they occur. Ideas are organized according to topics. Causes are listed leading to a conclusion, result, or effect. 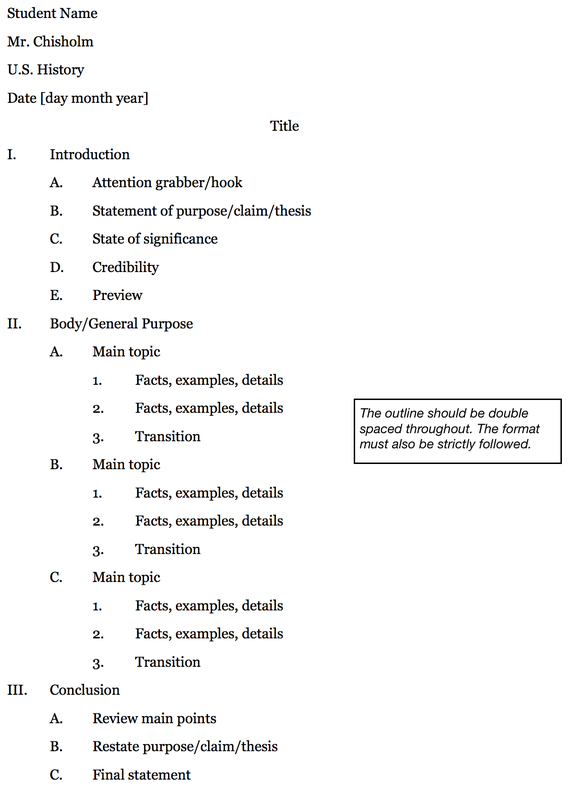 Students need to create an outline containing all the important points (3-5) about the subject to present to the audience. An outline should contain phrases, not sentences. It should show enough so the student knows what the speech will look like. This allows the student to quickly organize their thoughts and easily make changes to the structure as needed. Attention grabber/Hook: A statement, quote, or fact that catches the audience’s attention. Statement of purpose/claim/thesis: A simple statement that explains the main idea of your speech. Everything in the speech should relate to this main idea. Significance: Tell the audience why this topic is important. Preview: List the main ideas that you will discuss so the audience knows what to expect. Main topic: State a fact about your topic. Facts, examples, details: Give information that supports your main topic. Transition: A statement that moves from one main topic to the next. It should sum up the last idea and introduce the next main topic. Review main points: Restate the main points of the speech so the audience remembers the important parts. Restate the purpose/claim/thesis: Let the audience know what you want them to know or believe. Final statement: Make a statement that makes your audience think about what you have said. How did your subject affect history? Are there issues still unresolved? What did we gain from that person or event? 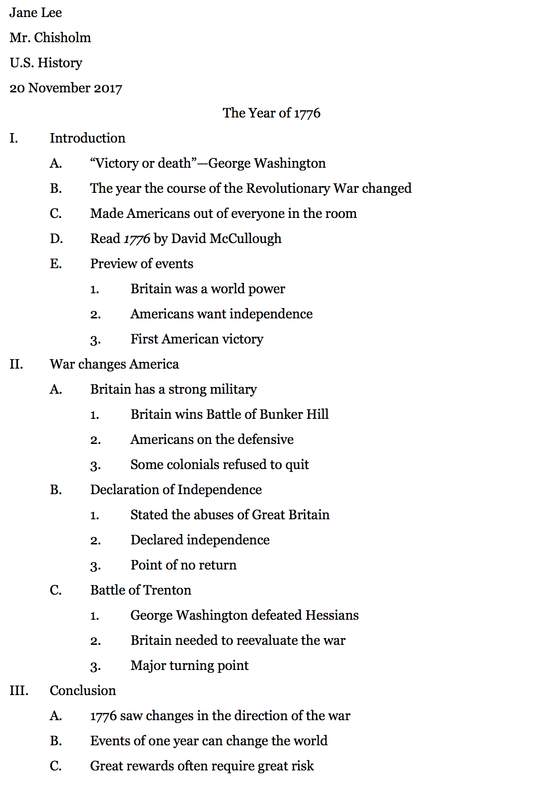 The outline should contain 3 to 5 main topics. Type the outline on one side of white paper using black ink, and a 12 point font (Times New Roman, Arial, or Courier New). Double space evenly throughout the paper. Use one inch margins on all sides. The outline should be three pages or less. Use only regular type—no bold or underlined print. 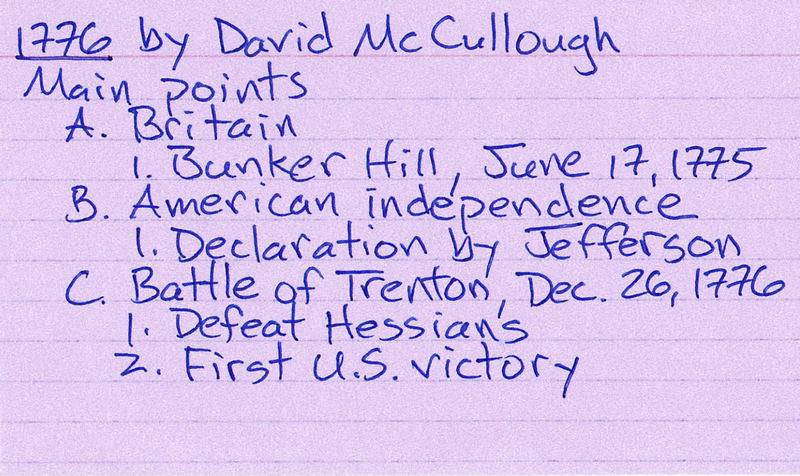 Students should use one 3x5 inch index card to write notes to help them deliver their speech. The index card should contain a brief outline of the speech to remind students the order in which they intend to deliver their information. USE NO MORE THAN 40 WORDS ON THE INDEX CARD. Under no circumstances should a student ever write in complete sentences or write out their speech on the index card. Students will inevitably start to read their speech. Once this happens, it is no longer a speech but a public reading. The student should practice the speech and time themselves. The speech should be between one and three minutes. Practice, practice, practice! When the student can recite the speech without thinking about it, they have it down. Students will be randomly called on to sign up for one of three days in which speeches will be presented. On that day, they should give their outline speech to the teacher just before proceeding to the podium. A rubric is a tool for determining the quality of an assignment. Study the rubric for this assignment to know specifically what is expected for grading. These are instructions for developing, organizing, writing, and preparing for the speech. They mirror the instructions in the right column. An outline is required. Students will turn in the outline prior to giving their speech. Follow the guidelines set in the sample outline. Copyright © 2017— , 2011, 2009. Mike Chisholm |	All Rights Reserved. The work contained herein may be used for non-commercial, non-profit educational use only.